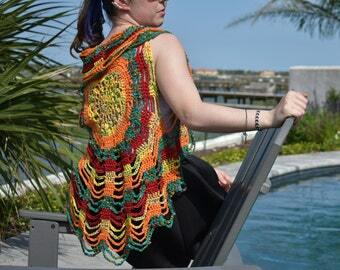 This listing is for a MADE-TO-ORDER crochet circle vest, mandala vest or gypsy vest. 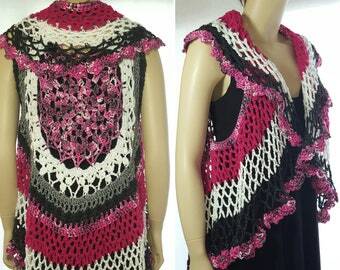 Imagine yourself twirling around at a music festival in this delightful vest made with your choice of colors! YOU NAME 4 COLORS IN THE "NOTES TO SELLER BOX" when you place your order OR, just tell me "rainbow" and I'll make it in the primary colors of the rainbow. 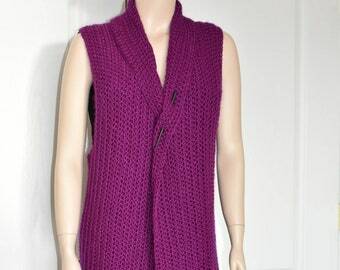 I'll message you with photos of your color choices to confirm them before I start making your vest. Your special order can be delivered (within the United States) within 2 weeks of your order. Orders from other countries usually take longer to be delivered. 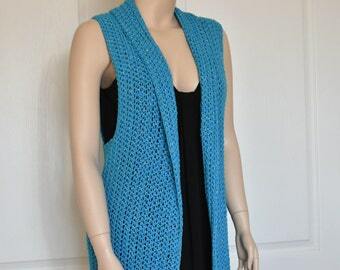 This vest has large arm holes so each size will fit a variety of bust sizes. I'd suggest choosing your size according to the WIDTH you need across the back under the arms. 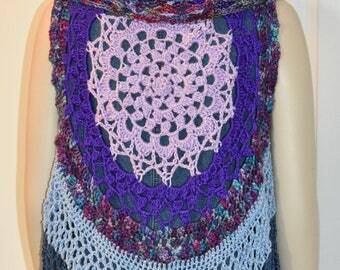 - Small is 14 inches wide across the back and about 32 inches long. The pink and aqua pictured is Small. - Medium is 16 inches wide across the back and about 34 inches long. The pink, white and gray pictured is Medium. 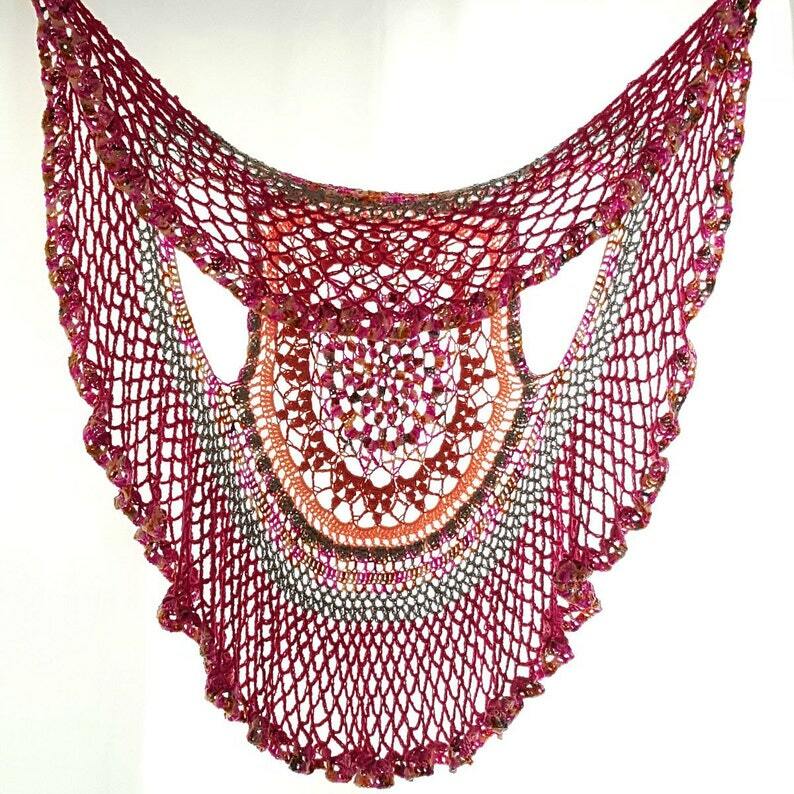 - Large is 18 inches wide across the back and about 36 inches long. The pink and orange pictured is Large. 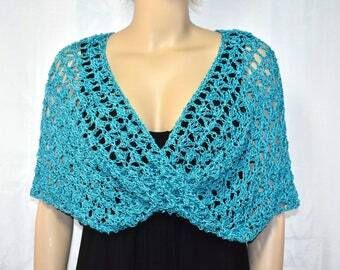 - XL is 22 inches wide across the back and about 38 inches long from the neck to bottom edge. The blue, white and tan pictured is XL. 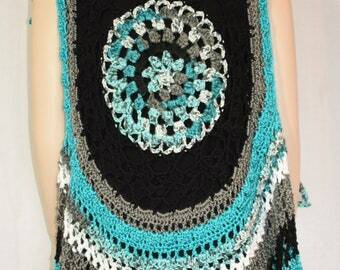 - XXL is 24 inches wide across the back between the arm holes and is about 40 inches long from the neck to bottom edge. NOTE: Length and width can be adjusted from the above sizes, upon request. When ordering, select the size closest to your preferred size and then kindly provide changes in the notes area when you order. Care instructions will be provided with your order base on the types of yarn used. The yarn types I use most often are cotton , acrylic and superwash merino wool (the NON-scratchy type of wool).